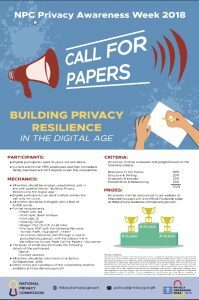 As part of the National Privacy Commission’s advocacy of establishing a culture of privacy among the public and empowering them to assert their rights, the NPC launched the Call for Papers with the theme “Building Privacy Resilience in the Digital Age” as part of the Privacy Awareness Week celebrations. This research papers competition aims to provide an avenue for the public to convey their viewpoints in privacy and data protection in the digital age. Moreover, it will also enable the NPC to determine crucial issues and concerns of various stakeholders, which is essential in formulating effective policies for a better implementation of the DPA. The De La Salle University College of Law (DLSU COL) released an updated list of requirements as per the Legal Education Board (LEB)’s Memorandum Order No. 7, Series of 2016. Prospective DLSU COL students are required to take the Philippine Law School Admissions Test (PhilSAT) in order to be admitted into the college. 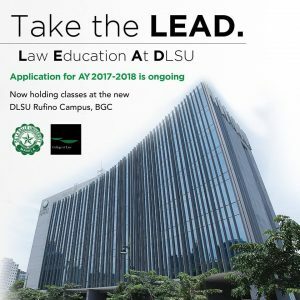 Other requirements include the completion of a Bachelor’s Degree with the required minimum number of units as required by the LEB for taking the Bar exam, submission of all pertinent documents, passing the DLSU Juris Doctor Aptitude Test (JDAT), and passing the College of Law Screening Panel interview. All students who wish to pursue legal studies in the country must take the PhilSAT. Registration deadline is April 3 and the testing date is on April 16. Testing centers are located in Manila, Baguio, Legaspi, Cebu, IloIlo, Davao, Cagayan de Oro, Tacloban City, Bacolod City, and Zamboanga City. A testing fee of Php 1,000 will be collected. For AY 2018-2019, the LEB is looking at scheduling the first PhiLSAT test in September 2017 with a second test in April 2018. The September 2017 test will take place in time for the enrollment and class opening in the second semester of AY 2017-2018, which will begin in November 2018. Prospective DLSU COL students may also visit http://www.dlsu.edu.ph/admissions/graduate/checklist-local.asp and http://law.dlsu.edu.ph/ for more information on admissions-related requirements. 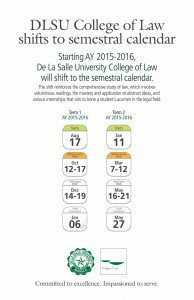 Aspiring Lasallian law students can submit their admissions requirements until June 10, 2017. For more information about the PhilSAT, please visit www.cem-inc.org.ph/philsat/ or call LEB at 567-4994. Inquiries can also be emailed to philsat2017@gmail.com. 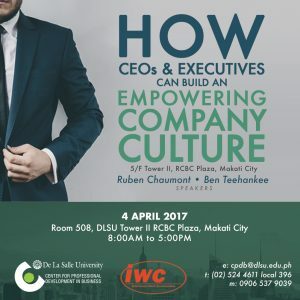 A company’s culture has a dramatic influence on employee engagement, creativity, and productivity. Learn how Positive Organizational Psychology can inspire innovation, motivate people to perform at their best, and enable CEOs and executives to build an empowered company culture. 1. 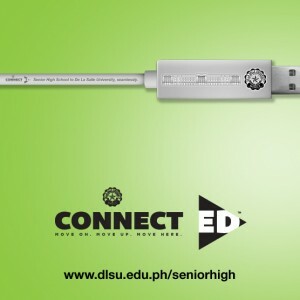 Are DLSU Senior High School Manila graduates guaranteed entry to De La Salle University? Yes, DLSU Senior High School Manila graduates will be guaranteed acceptance to the University. The student should meet the grade requirements for his or her preferred undergraduate course. 2. When can students apply to the Senior High School program in DLSU? The application period is from November 23, 2015 to January 30, 2016. 3. 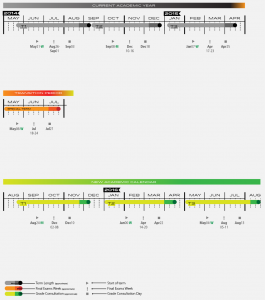 What are the academic Strands offered? DLSU will offer the following strands? 4. Are there scholarship opportunities available to Senior High School students? Yes, the University will provide scholarships to deserving students. Outstanding public school students who have completed Grade 10 may avail of free tuition under the Vaugirard Scholarship Program. 5. What are the grade requirements? 6. What are the application requirements? e. Guidance Transition Certificate – This form can be downloaded from the DLSU website and should be accomplished the Guidance Counselor, the student’s class advisor, or teacher. f. Two Recommendation Forms – The Recommendation Form can be downloaded from the DLSU website and should be accomplished by other school personnel who can assess the student’s disposition and capabilities in school. 7. What is the admission procedure for Senior High School applicants? 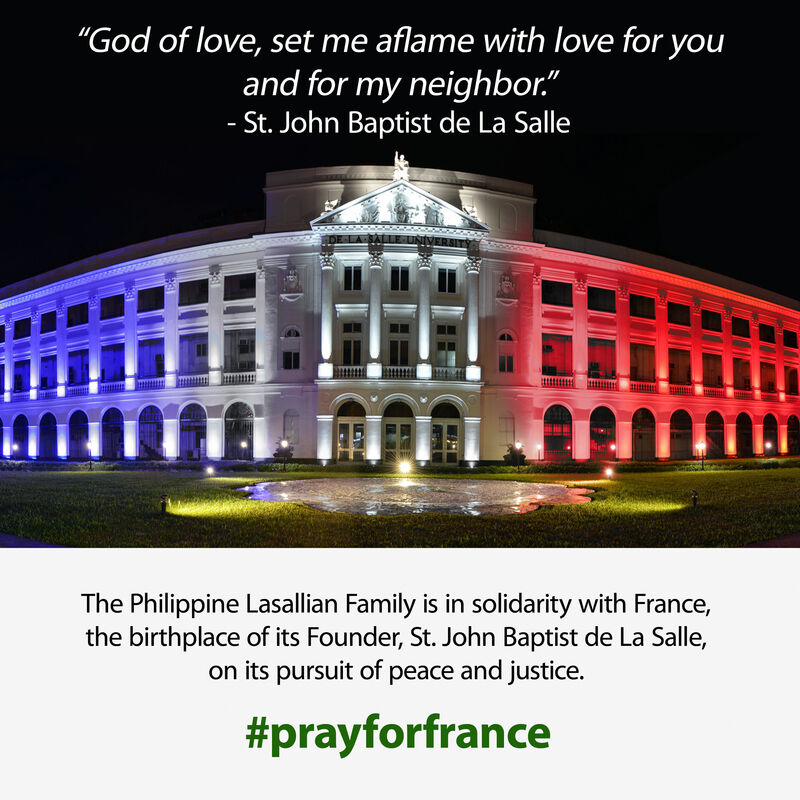 Applicants should download the forms from www.dlsu.edu.ph. Submit the accomplished forms and other requirements at the Senior High School Hub at the St. La Salle Hall of the DLSU Manila Campus starting November 23, 2015. Pay the testing fee of P600 at the Accounting Office. For Public High School students, the testing fee is waived. Present the Official Receipt of Payment to the SHS Hub at DLSU Manila Campus to secure the Entrance Test Permit and Document Tracking System (DTS) number for monitoring of application status. Only applicants who have submitted all the requirements will be given the test permit and an Admissions Kit. 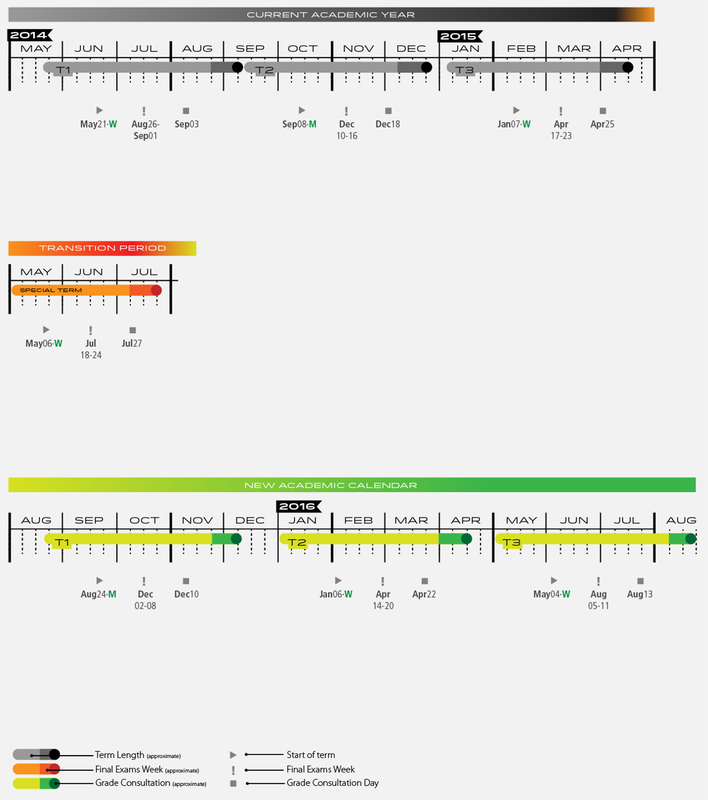 Take the entrance exam on the scheduled date. Applicants must present their examination permit to the proctor and must be at the designated room at least 30 minutes ahead of time. 8. How will applicants know the exam results? Exam results will be released on March 14, 2016. The test results may also be checked online via the DTS facility by entering the DTS number at http://enroll.dlsu.edu.ph/dlsu/dts. 9. How much is the annual cost of tuition and fees? Tuition and fees are estimated at P150,000 per year. Enrollment is at the start of every trimester. 10. Will DLSU Senior High School students be required to wear uniforms? No, there will be no school uniform. 11. 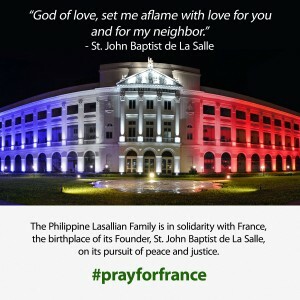 What is the contact email of the Senior High School Manila Campus? For further information, email the SHS Hub Manila Campus at seniorhigh@dlsu.edu.ph. De La Salle University Department of English and Applied Linguistics (DEAL) invites interested parties to “take their knowledge in writing instruction to the next level” and attend the special mid-year conference: “Writing 101 and 102 with Professor Kei Matsuda: Issues, Trends and Strategies in Writing Instruction and Publication” on July 22, 8:00 am to 5:00 pm at the Henry Sy, Sr. Hall, DLSU. 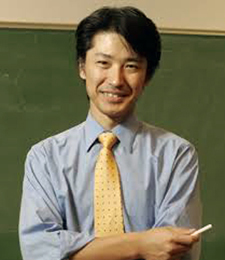 Students, teacher educators, and researchers will have the rare opportunity of imbibing the expertise and wisdom of world-renowned speaker Professor Paul Kei Matsuda, whose publications on writing have been valuable resources in writing instruction and research for many years. Prof. Matsuda is a Professor of English and Director of Second Language Writing at Arizona State University. He is also Concurrent Professor at Nanjing University. Currently, he is the president of the American Association for Applied Linguistics. The pre-conference registration fee of P1,200 will be honored until June 30. For on-site registration, a fee of P1,500 will be charged for professionals, and P1,000 for students. After payment is made, participants should email as scanned copy of the deposit slip to seminar2015/payments@gmail.com. Registration can be accomplished online through Dr. Paulina Gocheco at paulina.gocheco@dlsu.edu.ph and Ms. Nilda Perilla at ma.nilda.perilla@dlsu.edu.ph. De La Salle University and the Yuchengco Center Inc. will host the Twelfth Ambassador Alfonso T. Yuchengco Policy Conference on February 9 at the New World Hotel, Makati City. The forum will cover pressing issues in governance such as accountability and ethics in public service, justice and transparency in the Philippine Government structure, and reform frameworks for good governance. Former President Fidel Ramos, University of the Philippines Professor Dr. Alex Brillantes, DLSU Political Science Department Chair Dr. Eric Vincent Batalla, IBON Foundation Executive Director, and Yuchengco Center President Dr. Trinidad Osteria are slated to deliver lectures on the event. 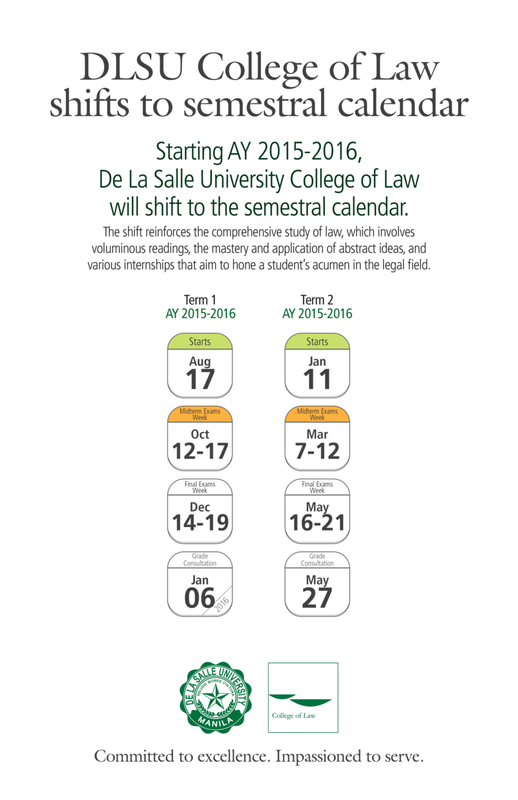 On August 2015, De La Salle University will implement a new academic calendar. As part of the adjustments for the incoming AY 2015 – 2016, a special term will be offered from May 4 to July 23 , 2015. The overarching vision of the ASEAN Economic Community is to establish a single market and production base that is fully integrated into the global market. Part of this vision is to strengthen the ASEAN University Network, of which De La Salle University is a founding member. A major step to achieve this is the alignment of programs and initiatives with global partner institutions. This move will facilitate DLSU’s academic engagements with universities from AUN and other international academic institutions outside the region. These collaborations include exchange programs, research, and other academic and network-building activities.